Kill P.E.D.R.O. was a design school project by graphic designer Thomas Kerff. I freelanced on the programming side. Thomas’ idea was to make a cooperative dual-player game where one player controlled a tank and another played as a hacker that manipulated the levels and environments via various command in a text parser. We made a playable level, and Thomas got his A+ for the assignment. 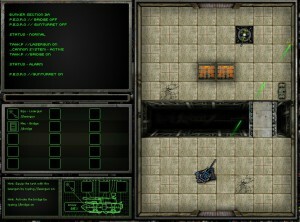 Screenshot from the demo level. Click to enlarge.